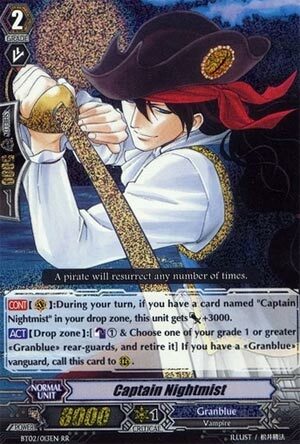 [CONT](VC):During your turn, if you have a card named “Captain Nightmist” in your drop zone, this unit gets [Power]+3000. [ACT](Drop Zone):[Counter Blast (1) & Choose one of your grade 1 or greater «Granblue» rear-guards, and retire it] If you have a «Granblue» vanguard, call this card to (RC). He was so hyped in the anime, but real-life demonstrated otherwise. Unable to pair with anyone but Romario for numbers and cutting into Counterblast for Basskirk: the only deck that ever RAN Romario, he simply couldn’t cut it. He didn’t have Samurai Spirit’s normal numbers to justify himself. Samurai Spirit was 7k and thus paired with the more useful 9k Grade 2s. Previous articleCross-platform Play Coming to PS4 – Starting Today with Fortnite!